In a bid to plug loopholes in the implementation of welfare schemes, Prime Minister Manmohan Singh and UPA chairperson Sonia Gandhi launched the nationwide Aadhaar Enabled Service Delivery from Dudu in Rajasthan. “In the states like Andhra Pradesh and Chhattisgarh, the people are now getting ration directly from ration shops, without any fraud. These cards also help the government to ensure that the subsidies and other allowances reach the correct beneficiary” said Sonia Gandhi. “Government has never been reluctant to provide subsidy to the poor. But it is facing difficulty to make sure that those benefits reach the correct persons. The Aadhaar card will help the government in ensuring that subsidy reaches its intended beneficiaries directly and the poor will not have to run from pillar to post to claim their rights”. “We had launched this project with great expectations and we are happy that we experience its benefits today. I am sure that the government will continue the dedicated and determined efforts to make this programme a big success, learning from the past mistakes and shortcomings” added Sonia Gandhi. Congress General Secretary Rahul Gandhi while addressing a big Congress rally in Bilaspur as part of his campaign in poll bound Himachal Pradesh said that only the Congress is working for the benefits of the farmers. He also slammed BJP for halting the welfare policies of the Congress-led UPA government at the centre. Congress President and UPA Chairperson Sonia Gandhi, while addressing a well attended Congress rally on Tuesday at Shimla - the capital of poll bound Himachal Pradesh- attacked the ruling Bharatiya Janata Party (BJP) state government for lack of development in the state and also backed the UPA’s FDI policy..
Sonia Gandhi attacked the BJP for misleading the people on Foreign Direct Investment in retail. “It is for the benefit of the farmers and aam aadmi, the Central government has decided to allow FDI in retail. By this policy, the farmers will be able to get proper prices for their produce by selling their goods directly at the markets,” and added “Further the common man would be able to get their security needs at a fair and affordable price. The agricultural farmers suffer a lot because of the shortage of cold storages and their products get rotten. The FDI will address this serious problem also. But he BJP is engaged in false propaganda against our FDI in retail policy. The important thing is that every state has the liberty not to implement FDI in their state”. “It seems that BJP is not at all bothered about the issues of the farmers and they are interested only to protect their narrow political interests,” quipped the UPA Chairperson. Striking an emotional chord with the women in the region, Sonia Gandhi said “My speech will not be complete without remembering the contributions of my sisters of this beautiful state. I appreciate that the women here do fulfill their responsibilities in a commendable manner. Aiming for further upliftment of the women in our society, especially my sisters in the hill areas, the Congress government implemented 50% reservation for women in panchayats. We also doubled the salaries of anganwadi workers. We also helped the women to avail bank loan at low interest rates through Self Help Groups”. Congress President and UPA Chairperson Sonia Gandhi, while addressing a well attended Congress rally on Tuesday at Shimla - the capital of poll bound Himachal Pradesh- attacked the ruling Bharatiya Janata Party (BJP) state government over corruption and lack of development in the state. She also listed out various development initiative of the Congress-led UPA Government at the centre. She then took on the BJP govt. for not implementing the central sdchemes properly and said “The central government is committed for the development of Himachal Pradesh and also released huge financial assistance for the state. But the state government did not use the funds sent under Mahatma Gandhi NREGA or the financial aid released for the repair and construction roads properly. The Congress government also had sanctioned huge funds for the development of Shimla under the Jawaharlal Nehru National Urban Rural Mission but there are no changes visible here. I want to ask where thousands of crores of rupees provided by the centre for the development of the state and its people have gone”. Focussing the women in the state the Congress President said “My address will not be complete without remembering the contributions of my sisters of this beautiful state. I appreciate that the women here do fulfill their responsibilities in a commendable manner”. “ Aiming for further upliftment of the women in our society, especially my sisters in the hill areas, the Congress government implemented 50% reservation for women in panchayats. We also doubled the salaries of anganwadi workers. We also helped the women to avail bank loan at low interest rates through Self Help Groups” said Sonia Gandhi highlighting the UPA policies. Congress General Secretary Rahul Gandhi slammed the BJP for halting the pro-poor policies of the Congress-led Central government and also asked whether it took any actions against its leaders who are accused of corruption. While addressing a big Congress rally in Bilaspur, Himachal Pradesh he reiterated that only Congress is committed to work for the farmers, poor and aam aadmi. Prime Minister Manmohan Singh, Congress President Sonia Gandhi and Congress General Secretary Rahul Gandhi paid rich tributes to former Indira Gandhi on her 28th death anniversary. They paid floral tributes to the departed leader at Shakthi Sthal in New Delhi, the samadhi of Indira Gandhi. Congress does not cheat people by showering promises said Congress President and UPA Chairperson Sonia Gandhi while speaking at an election meeting in Saharanpur. 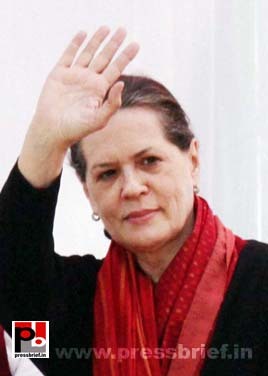 She held the misrule by the non-Congress rule in the past 22 years for the bad state of affairs in Uttar Pradesh. Congress President and UPA Chairperson Sonia Gandhi, while addressing a well attended Congress rally on Tuesday at Shimla - the capital of poll bound Himachal Pradesh- launched a scathing attack on the ruling Bharatiya Janata Party (BJP) state government over lack of development in the state. “This is one of the most beautiful places in the country and what is the situation here at present? What BJP did for this state in the past five years? Why the state of affairs is so pathetic here? Had they paid little more attention towards development, the situation would have been much better here. Because of the scarcity of electricity and water the people here are facing a lot of difficulties. The educated youth here are jobless. There are no sufficient teachers in schools and adequate doctors in hospitals. The farmers and other workers also have been facing hardships at present. The life of my sisters here are full of troubles” said the Congress President. What happened to the promises made by the BJP? It has shattered your dreams. The duty of a government should ensure welfare of the poor and justice to all sections of the society” added Sonia Gandhi. Without taking any names, she made a veiled attack on BJP national president Nitin Gadkari, saying that the saffron party never took action against its leaders accused of corruption. “No other party fought corruption as much as the Congress and UPA. We took stringent legal actions against those who proved corrupt. I want to ask the BJP, has it taken any action against its leaders who are accused of graft? No; never” argued Sonia Gandhi. “It was the Congress and UPA which the crucial legislation of Right To Information, which is a powerful tool to fight corruption. It was the Congress, which made a strong Lokpal Bill to fight corruption and got it passed in the Lok Sabha. But who stopped the passage of the same in the Rajya Sabha? It was the BJP which stalled it. They are not serious about corruption and their fight against corruption is just a show off. In fact, they are not against graft but are against the Congress” she added. Congress President and UPA Chairperson Sonia Gandhi, while addressing a well attended Congress rally on Tuesday at Shimla - the capital of poll bound Himachal Pradesh- slammed the ruling BJP government in the state for lack of development in the state. Congress President and UPA Chairperson Sonia Gandhi addressed a well attended rally in Shimla, Himachal Pradesh as part of her ongoing Congress campaign for the assembly elections in the state. She attacked the BJP state government over corruption and also made a veiled attack on BJP chief Nitin Gadkari. Congress President and UPA Chairperson Sonia Gandhi, while addressing a well attended Congress rally on Tuesday at Shimla - the capital of poll bound Himachal Pradesh- launched a blistering attack on the ruling Bharatiya Janata Party (BJP) state government over corruption and lack of development in the state. Sonia Gandhi also attacked the BJP for misleading the people on Foreign Direct Investment in retail. “It is for the benefit of the farmers and aam aadmi, the Central government has decided to allow FDI in retail. By this policy, the farmers will be able to get proper prices for their produce by selling their goods directly at the markets,” and added “Further the common man would be able to get their security needs at a fair and affordable price. The agricultural farmers suffer a lot because of the shortage of cold storages and their products get rotten. The FDI will address this serious problem also. But he BJP is engaged in false propaganda against our FDI in retail policy. The important thing is that every state has the liberty not to implement FDI in their state”. “It seems that BJP is not at all bothered about the issues of the farmers and they are interested only to protect their narrow political interests,” quipped the UPA Chairperson. This was Sonia Gandhi’s second round of campaign in the state after her recent visit on October 22. In a bid to plug loopholes in the implementation of welfare schemes, Prime Minister Manmohan Singh and UPA chairperson Sonia Gandhi launched the nationwide Aadhaar Enabled Service Delivery from Dudu in Rajasthan, marking the second anniversary of the Unique Identification Authority of India (UIDAI). While addressing the function, Congress President and UPA Chairperson Sonia Gandhi said the Aadhaar scheme gives identity to the common man and is a tool to claim benefits. The Unique ID project is about to begin a new phase - that of facilitating transactions. Aadhaar-enabled applications will be used for ensuring direct payments to the correct beneficiary. Congress President and UPA Chairperson Sonia Gandhi addressed a big rally in Shimla, the capital of poll bound Himachal Pradesh. She slammed the ruling BJP state government over corruption and for not doing anything for the development of the hill state. In the past 22 years, the people in UP got only toll promises and as a result the state slipped down while all other states surged ahead, said congress General Secretary Rahul Gandhi while addressing a big election rally in Thakurdwara in Uttar Pradesh as part of his poll campaign for Congress in poll bound Uttar Pradesh. Congress always listened to the people and made policies accordingly said the congress leader.